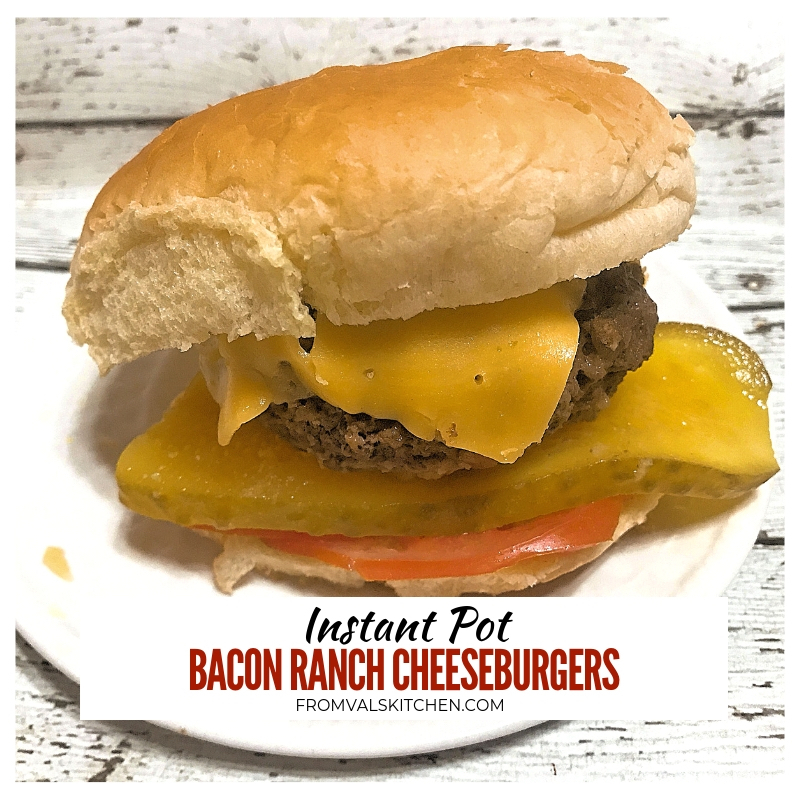 Flavorful, juicy Instant Pot Bacon Ranch Cheeseburgers are so easy to make that they almost cook themselves, freeing your valuable time for other things. Cheeseburgers are a big favorite with families and ours is no exception. While I love eating a thick, juicy burger, I don’t always enjoy cooking them. In the winter it’s just too cold to be grilling. Cooking them indoors on the stove is always an option, but I hate the flipping and splattering that comes with that. I’ve had steamed burgers before (I made them in the Ninja Cooking System) and they can be very good. I decided to try making burgers in the Instant Pot about 2 weeks ago. I’ve made them in there 3 times now and can say that making them this way is very easy and results in minimal clean up. Steaming the burgers also makes for really easy clean up. 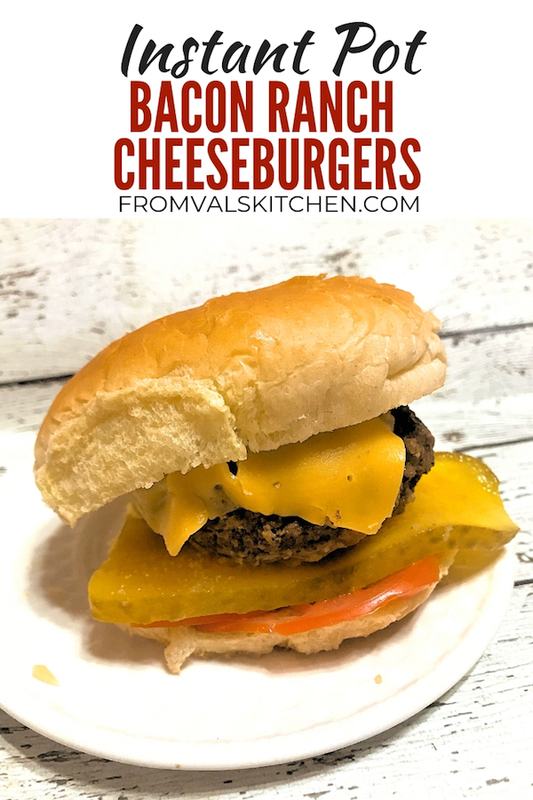 Instant Pot Bacon Ranch Cheeseburgers are flavorful, juicy burgers that are so easy to make they almost cook themselves. They’re equally as perfect for a busy day as they are a relaxed one, which means that time previously spent flipping burgers can now be used for the important things in life like family movie night. These burgers can easily be adapted to include any other seasonings you like, making them super versatile. 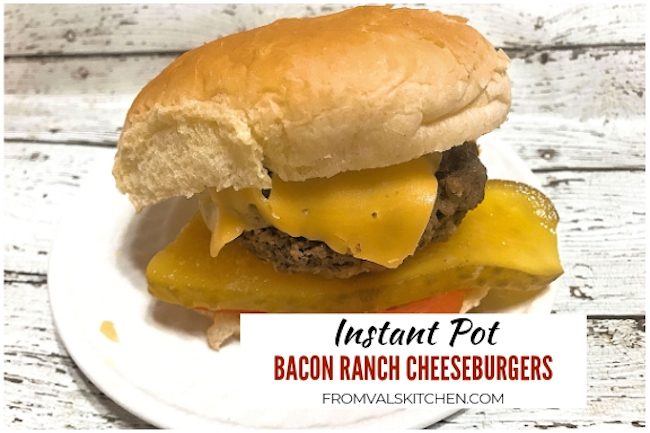 Here’s how you make Instant Pot Bacon Ranch Cheeseburgers. The recipe as written makes 4 burgers and can easily be scaled up to make a couple more. Plug in the Instant Pot or other electric pressure cooker in. Pour the water into the pot and place the steaming rack into the pot. 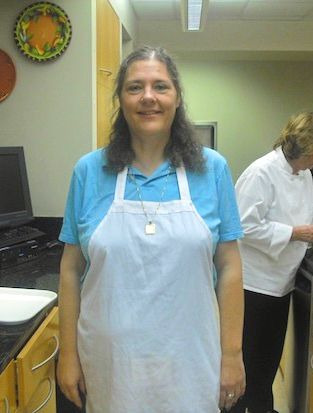 Place the ground beef into a large glass mixing bowl. Add the ranch seasoning and crumbled bacon to the bowl and combine thoroughly. Divide the meat into four equal hamburger patties. Wrap each hamburger patty in aluminum foil. To do this, place each burger on a piece of foil. Fold the left and right sides into the middle, then the top and bottom. Place the foil-wrapped burgers into the pot. Put two on the rack, then put the other two on top of the first two in a staggered pattern. Put the lid onto the pressure cooker and close to seal. Set the pressure cooker to cook on manual high pressure for 10 minutes. Once the cooking time has elapsed, do a quick pressure release. Remove the foil-wrapped burgers from the pot. Unwrap the burgers and place a slice of cheese on top of each, then place on a roll and top as desired. Plug the electric pressure cooker in. Pour the water into the pot and place the steaming rack into the pot. Place the ground beef into a large glass mixing bowl. Add the ranch seasoning and crumbled bacon to the bowl and combine thoroughly. Divide the meat into four equal hamburger patties. Wrap each hamburger patty in aluminum foil. To do this, place each burger on a piece of foil. Fold the left and right sides into the middle, then the top and bottom. Place the foil-wrapped burgers into the pot. Put two on the rack, then put the other two on top of the first two in a staggered pattern. Put the lid onto the pressure cooker and close to seal. Set the pressure cooker to cook on manual high pressure for 10 minutes. Once the cooking time has elapsed, do a quick pressure release. Remove the foil-wrapped burgers from the pot. Unwrap the burgers and place a slice of cheese on top of each, then place on a roll and top as desired. Serve immediately. Enjoy!